In the River Rhine. In it. It is always a pleasure to hear a great orchestra take on a major score that might sound half-muffled emerging from the pit of an opera house. Das Rheingold, free to burst in the air and dazzle our ears is sure to make Wagnerians happy. Geffen Hall seldom provides a supreme auditory experience, but there were many extraordinary moments in the course of its valedictory to retiring Maestro Alan Gilbert last Thursday night (repeated Saturday and Tuesday; tickets do remain). In all the familiar Wagnerian welter, there were swatches of flavor and color that had not struck me before—like figures of speech in a Shakespeare play in some new actor’s interpretation. This is the sort to make any such occasion fascinating. The whacking first entrance of the Giants made everyone sit up and take notice even more than did the black leather dusters emphasizing the height of the singers of those roles. Too, the flowing river of violins has rarely seemed to brim with silvery whitewater runs as it did on this occasion. Many a dainty brass or woodwind figure also struck me as brighter than memory presented it. Das Rheingold takes over two and a half hours of non-stop storytelling to set us up for the three nights of the Ring. No other act in the saga that follows its four scenes takes more than two and a bit, so the New York Philharmonic’s choice of the opera put a certain strain on the physical powers of regular concert-goers. There was a steady trickle of early departures on Thursday, but the great majority of us stuck it out and demonstrated every sign of feeling well rewarded. New York Wagnerians have appetites to be appeased, y’know. We haven’t had any portion of the Ring in these parts for, it seems like, forever—not so long ago, you used to get Walküre or Götterdämerung at the Met ever other year. Do the complications of staging the present Ring render just one of the bunch every year or two an impossible aspiration? At Geffen Hall, a moderately stellar cast sang at a high standard of both art and decibelage, and they “acted” many of the scenes in a gallant if barebones fashion. Those who have come to dread the excesses of opera producers could take pleasure in the suggestion of activity provided by Louisa Muller. In the absence of scenery, the costumes by David C. Woolard were soothing and suitable, especially the black-striped charcoal-gray outfits of the Nibelung brothers and the regal crimson silk for Fricka, matched to the waistcoat of Wotan’s suit. Wotan had a spear. Donner had a hammer. There was sparkly gold pixie dust tossed from hand to hand to represent the Tarnhelm and its illusions, my favorite motif. Yet punches were pulled. There were moments where the grandeur, the processional build of a scene in the monumental architecture of a Ring felt underplayed. I felt less than exalted by the Gods’ Entrance into Valhalla, perhaps because the singers (who have nothing more to sing) had left the stage, perhaps because the opera house has not been Maestro Gilbert’s principal home. The full dynamic range achieved by having the instruments below the singers and the special effects meant that, in concert, the picture lacked a dimension, that heart-thrilling glamour that fills those who attend a set achieved by clouds, castles, rainbows and the whole meteorological grand finale. It was a great concert but it did not transport one to another world where such things may or may not be real. Or that was my take—which may have as much to do with a failure of my own projective illusion as with the dry sound of Geffen Hall. 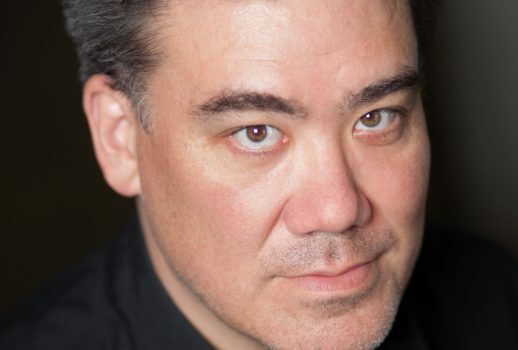 New York loves Eric Owens and Jamie Barton, the evening’s Wotan and Fricka. There is no doubt of this. And Barton, who has been singing Fricka in Houston, has the chops for it, a smooth, hall-filling sound, agitated because Fricka is so often in a mood, don’t you know, but the emotions play out over a calm, well-regulated sea. It is, perhaps, heretical of me, but I do not find Owens convincing as Wotan. He hits the notes and, as a singing actor, projects both the pride and the insecurity of this conniving personality. But his gruff, somewhat hollow singing of the music makes me nostalgic for the long and glorious reign of James Morris, with his bel canto background. Owens does not fill out the spaciousness of the score. In Owens’s old role of Alberich, Christopher Purves, another Houston alum, made an impressive local debut. This character experiences the widest range of emotions in Rheingold; it calls for dramatics more than voice, and Purves gave us both. His sneers were never unmusical, his curse was unnerving. One becomes curious about his Don Giovanni, upcoming in London. Peter Bronder was effective as Mime. Russell Thomas was one of those Loges who eats up the stage like a hearth fire out of control. The insinuating lyricism of his “snake-oil” sell of the Rheingold’s appeal won over the gods and the audience Wagnerians. Brian Jagde sang a capable Froh, Christian Van Horn an impressively surly Donner, Rachel Willis-Sørensen a statuesque but unexciting Freia—it’s difficult to believe she was as helpless before the Giants’ lust as the script obliges her to be. Kelley O’Connor sang a perfectly passable Erda, lacking the voice-from-the-deeps that one hopes for in this role—or does the Geffen stage not permit such a sonority? Stephen Milling doesn’t have much to do as Fafnir, unfortunately, but he had the total ominous deal at his command. I’ve loved his voice since his first Hundings at the Met, a long time ago now, and I’d like to hear him take on Gurnemanz or Marke. There have been more lovable Fasolts than Morris Robinson, but he conveyed the character’s frustration well. The Rhinemaidens frilled and danced about the stage in sea-blue gowns. Jennifer Zetlan was having an off-night, with pitch problems, but Jennifer Johnson Cano and Tamara Mumford were deliciously present. Two days later, the music of this concert is still delectably in my ears—ringing, perhaps, but that’s been said by others, long ago. I hope it will worm its way in and stay for a while.